Islands of thin sand, white beaches surrounded by green forests at short distance from the great Australian Coral Reef. 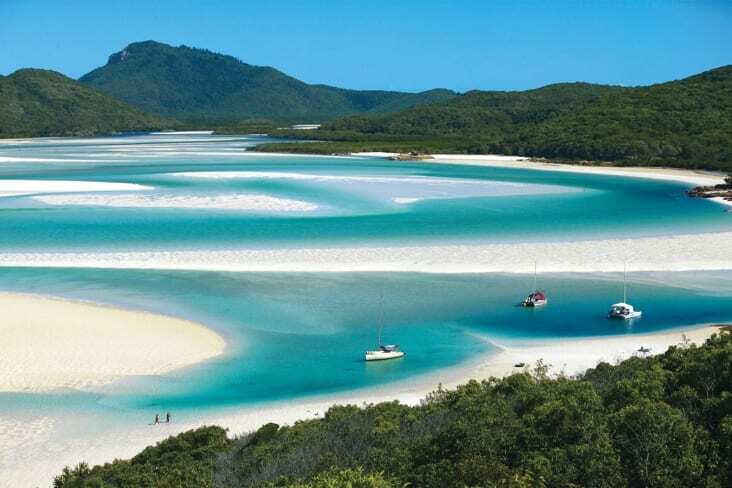 These are the Whitsunday Islands, one of the world’s Seven Wonders and UNESCO heritage of humanity. 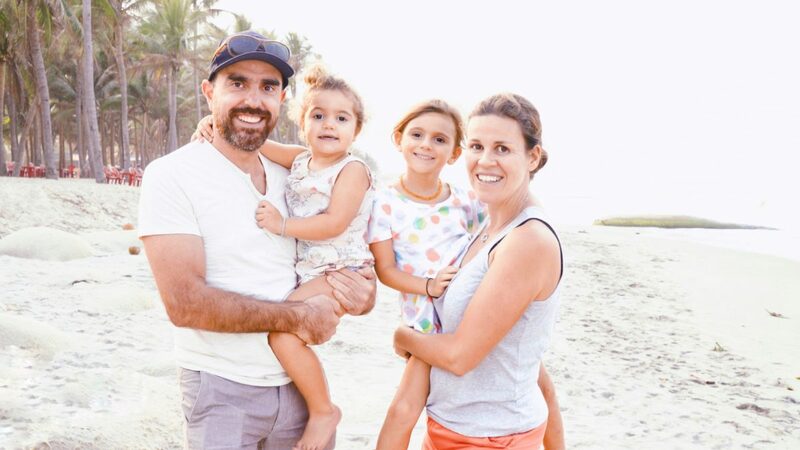 Some of these 74 islands are nothing more than small sand strips with one single palm tree in the middle, others host five-star resorts or are the ideal destination for family travels. The most popular and easy to reach island – the only one of the Whitsundays with an airport – is Hamilton Island: not big, but not even that small to make you feel trapped in the middle of the ocean, it is a good starting point for daily trips to the Coral Reef or other Whitsunday islands. A comfortable island with no cars, where transfers are made by golf cart. A nice selection of restaurants and many activities on the sea as well as on the land. Obviously, our first trip has been to the Coral Reef. You can get there by boat (in three hours) or by helicopter (about half an hour). 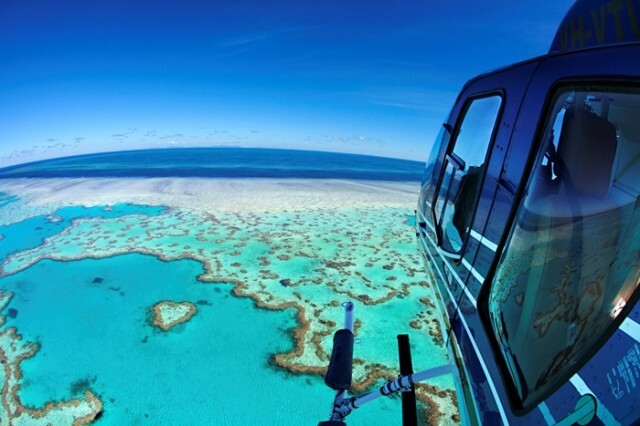 The helicopter also allows for a stunning sight from above of the Reef and the Whitsunday archipelago. It lands on the ReefWorld platform in the Hardy Reef, and in a few minutes you are ready to dive or to snorkel. If you opt for the boat… well, you better have some endurance for rough waters. But you can’t say you were at the Whitsundays if you didn’t hit Whitehaven Beach, Australia’s most pictured beach and one of the most beautiful and beloved beaches in the world. Seven kilometres of white sand and 98 per cent of silicon, which sounds in such a distinct way when you walk barefoot on it. 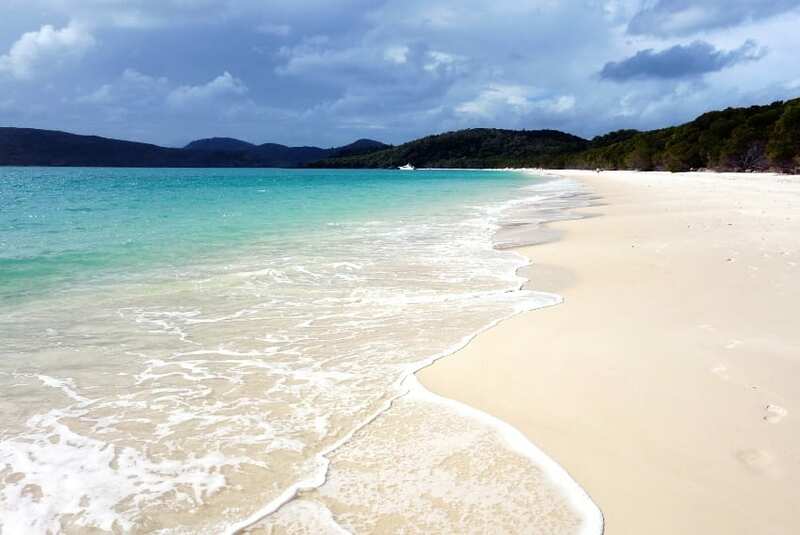 Whitehaven Beach is part of the Whitsunday Islands National Park and can only be reached by ferries connecting with the most renown tourist spot, including Hamilton Island and Airlie Beach. The island doesn’t host hotels, bars, restaurants… just a camping place to fully enjoy the beach without any distraction. Accommodation on Hamilton Island: from overwater bungalows to luxurious resorts, the island offers plenty of choice. We stayed at the Reef View Hotel: looks a bit like a barack from outside, but there is a breath taking view over the bay from the rooms. How to get here: daily flights to are available from Brisbane and Sidney to Withsundays Airport or Hamilton Island Airport. For helicopter flights over the Coral Reef check Hamilton Island Air. Ferries to the Coral Reef: about 150 € per person, including lunch and the gear for diving or snorkeling. A night on the ReefWorld platform: starting from 270 € for a sleeping on the rooftop, including meals. Bookings have to be made at least 3 days in advance to [email protected] or on CruiseWhitsundays.com.